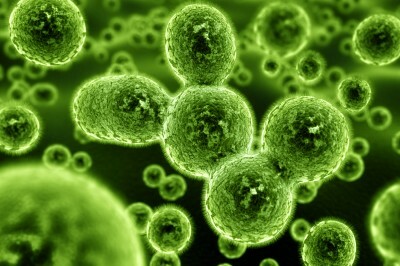 Infections and infectious diseases result from the invasion of a pathogen into the body. Such a pathogen may include a virus, bacteria, fungus, or protozoan. As of 2002, the World Health Organization estimated that there were 14.7 million deaths caused each year by all infectious diseases. HIV/AIDS was the second highest cause of deaths at 2.8 million a year. Although the vast majority of bacteria are harmless or even beneficial, bacteria that are pathogenic cause infectious diseases. Two common pathogenic bacteria found on the skin are staphylococcus and streptococcus. They can cause skin infections, pneumonia, meningitis or sepsis. Methicillin-resistant Staphylococcus Aureus (MRSA) is a bacterium that is tougher to treat than most strains of staphylococcus aureus because of its resistance to most commonly used antibiotics. In the hospital setting, pathogens are very plentiful. Hospital acquired infections, called nosocomial infections afflict nearly 2 million patients each year and are responsible for nearly 90,000 deaths. It is estimated that about 70% of nosocomial infections are resistant to at least one drug. Thus, the earlier a patient can be discharged from the hospital, the better chance he has at avoiding a such an infection. Infections can afflict virtually any part of the body. Osteomyelitis is an infection which occurs in the bone. It can be very difficult and time consuming to treat and can result in amputation of a limb. Intra-abdominal infections can also be difficult to treat, with mortality rates ranging from 3.5% in patients with early infection following a penetrating abdominal trauma to over 60% in patients with a well established infection and organ failure. Protozoan infections are parasitic diseases caused by protozoa. Some examples include malaria, toxoplasmosis and trichomoniasis. Viral infections are caused by virus, which is much smaller than bacteria and encapsulated by a protective coating, so it is more difficult to kill than bacteria. Viral infections include, HIV/AIDS, Measles, Hepatitis C, Rubella, Herpes Simplex, and influenzaIn terms of medical/legal issues involving infections, it is usually very clear that a hospital or physician is not responsible for causing an infection in a patient. (although rare cases involve unnecessary exposure). Usually, the issue involves the timely diagnosis and treatment of the infectious process. If the proper treatment is delayed, severe consequences can flow to the patientIdentification of infections and the proper treatment usually involves taking a culture from the infection site and reviewing it under a microscope. The pathogen can then be identified and tested to determine which type of antibiotic or other treatments are the most effective.